Sandy Shores is a classic Muskoka cottage absolutely perfect for your family vacation! Located on sheltered Townsend Bay, Lake Joseph, this cottage boasts clear waters, sandy shores, sunset exposure and lots of gently sloped land for kids to play and roam. Situated on 6 acres of land near the end of a quiet road, Sandy Shore offers essential privacy with plenty of opportunity for quiet walks through the woods and along the tree lined country lane way. The road is open all year and Sandy Shores has deeded right of way to use the entire roadway from the cottage to Peninsula Road. In the heart of Ontario’s cottage playground, the cottage is close to the Lake Jo Club, Port Sandfield and the JW Marriott, Sandy Shores offers the best of Muskoka cottage lifestyle: calm waters, sunsets, golf, fine dining, yoga and family time. Designed with families in mind, there’s a playground and bunkie for the kids, a coach house for the young adults to chill, a two-bedroom boathouse for quiet reflection or waterside gatherings and a finely finished cottage with a Muskoka room, expansive covered porch, separate family room, spacious dining room for relaxed meals and evening discussion and a large river rock wood burning fireplace for cool evenings. 3 TV's with satellite service are located as follows: Family room, master bedroom and boathouse. On the main floor you will find a master bedroom oasis with it's own private ensuite bath featuring a soaker tub and a walk in shower. Upstairs there are three guest bedrooms with a shared 4 pc bath plus there is a children's room with two twin beds, a two bedroom boathouse and a loft over the garage with it's own bathroom. The Main cottage has full AC and the boathouse and loft have portable AC units. Townsend Bay is away from the main channel of south Lake Joe. It’s a safe place for kids to learn boating and water skills or for people who prefer to swim or wade in calm waters. There’s plenty of shallow water with sandy bottom. Deeper water off the dock and a swim platform with diving board. The water is about 4 feet deep at the edge of the dock and deepens to about 8 feet. To the left of the dock & for the entire dock length plus 20 to 25 feet wide the area is clear and has a beautiful sandy bottom. At the side of the boathouse is a purpose installed ramp for PWC’s and inside there is a large boatslip plus another slip outside. There’s also a bathroom at dock level as well as one upstairs in the boathouse. The large deck provides full sun or shade. It’s a great place for waterside living and perfect Muskoka sunset evenings. Inside the cottage you will find wide plank pine floors, tasteful wood trim and traditional bead board. Both reflecting Muskoka history and current life at the same time, Sandy Shores is the kind of cottage where family memories are made from generation to generation. A perfect year round cottage, it serves as a getaway throughout the year. Sand! Lots of it. Only a small percentage of big lake shoreline is natural sand. This property enjoys gentle entry sand bottom for most of its 300′ waterfront. Great for kids of all ages. 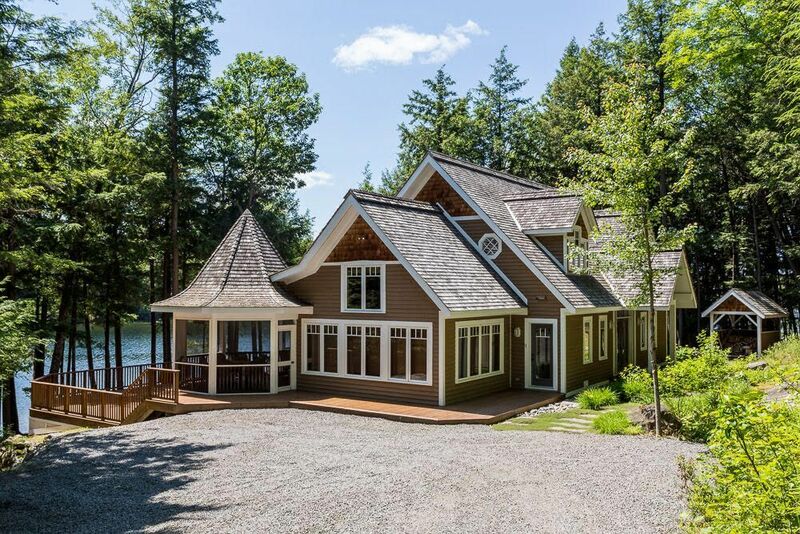 Located on the placid, clear waters of sheltered Townsend Bay, this cottage is secluded from the hurly burly of South lake Joseph, near the end of a quiet road. Facing west, enjoy lots of sun and sunsets on the spacious dock with covered area. Perfect for multi-generational families year round, the main cottage has 4 bedrooms plus there are two bedrooms in the boathouse, a large bedroom or dorm in the coach house & with 4.5 bathrooms in total. Beautifully finished, the building exudes relaxed cottage living with 2 screened Muskoka Rooms, a Great Room, separate family room and a wonderful verandah. There’s a children’s Bunkie & playground to complete outside activity. Available with the property are three kayaks, 2 paddle boards, a catamaran for experienced sailors and an Air Nautique power boat available for rent. A family oasis that’s hard to beat. Year-Round Access. Boathouse and bunkies closed in winter. NOTE that occupancy in winter is 8 people as the boathouse and loft are closed.